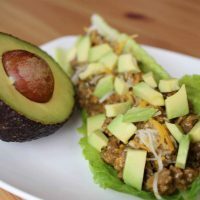 Call them lettuce tacos, taco lettuce wraps, keto tacos–whatever you like! 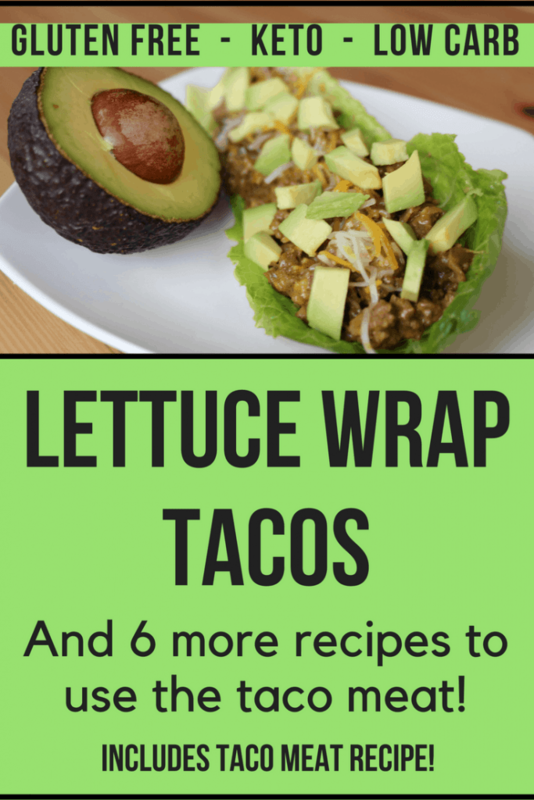 These Easy Keto Lettuce Wrap Tacos are a great, grain free gluten free way to eat your tacos low carb! You can use your own taco meat recipe, or use our Keto Super Taco Meat for this and several other recipes! When I first had lettuce wrap tacos, I had no idea that there were low carb grain free options. I knew there were flour tortillas, corn tortillas, and lettuce wraps. I admit, I thought people were a little bonkers for putting their taco fillings inside a piece of lettuce. Lettuce wrap tacos? Weird! I’ve been doing our tacos this way for years now, and I’m honestly quite used to it. Even my kids, who are very picky about their standby meals like tacos and spaghetti, don’t even comment anymore when I make lettuce wrap tacos. They’re too busy chowing down! Which Type of Lettuce Should I Use For Lettuce Wraps? The trick is to choose the right type of lettuce. Do you remember when iceberg was the only option for lettuce in grocery stores? Or at least, that’s what everyone used! Do you love our recipes? Sign up to get recipes in your email inbox and get a FREE keto foods grocery list! Now there are plenty of the best broadleaf lettuces available in grocery stores. Here’s a handy list of lettuces that work great for healthy lettuce wraps! Try one type of lettuce for your keto lettuce wrap tacos, and if you don’t like it, try a different one! We normally use romaine because it has a good crunch and my kids can handle it better because of the stiff rib down the center. Bibb and butter lettuces tend to be softer and more flexible. Love taco themed meals? Try our Keto Mexican Bubble Pizza! Replace your regular tacos with these lettuce tacos. Using our Keto Super Taco Meat, your keto tacos will never be the same! Don't forget to check out the other Mexican recipes in the links above! Keto friendly taco toppings: shredded cheese, fresh diced tomatoes, diced avocado, chopped cilantro, lime juice, sour cream, low carb salsa, etc. Pull the larger leaves off of the lettuce head. Rinse and pat or drip dry. Place whatever keto toppings you’d like in the fold of each leaf, as if it were a hard taco shell. Eat as you would a taco in a tortilla! 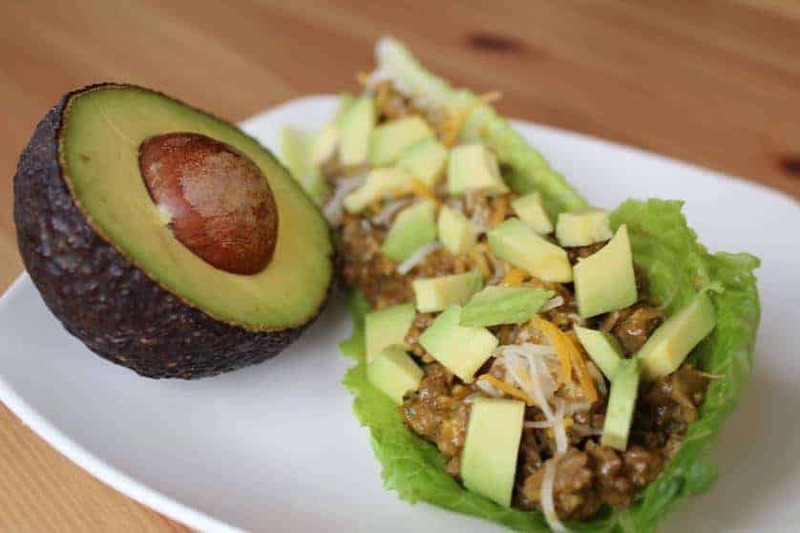 Macros for these Easy Keto Lettuce Wrap Tacos are for a serving of 4 large romaine leaves, 1/2 cup Keto Super Taco Meat, 1/3 cup avocado, 1/4 cup Mexican blend cheese. If you're adding other toppings, be sure to include those in your macro count. Pin this recipe now to your Mexican food board! Hover over image below and click “save”!